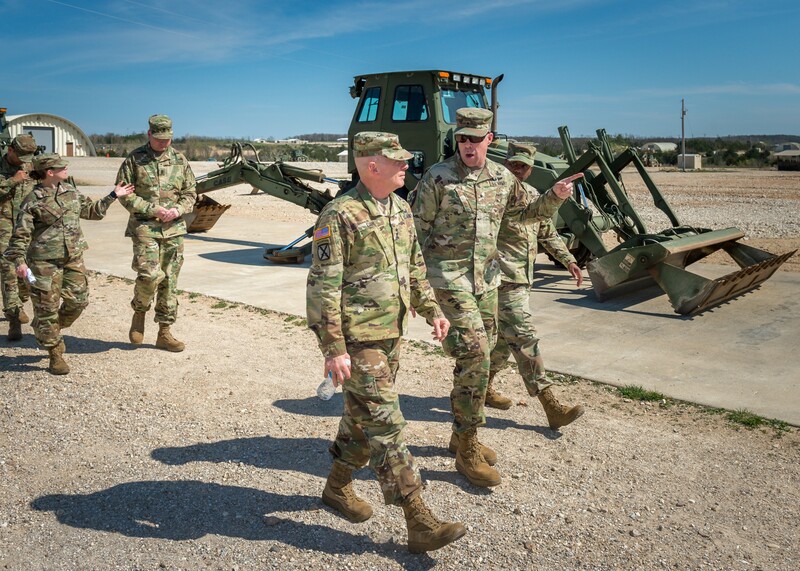 The commander of the U.S. Army Installation Management Command visited Fort Leonard Wood April 11 through 12 to get a firsthand look at Missouri's largest military installation. Lt. Gen. Kenneth Dahl, accompanied by IMCOM Command Sgt. 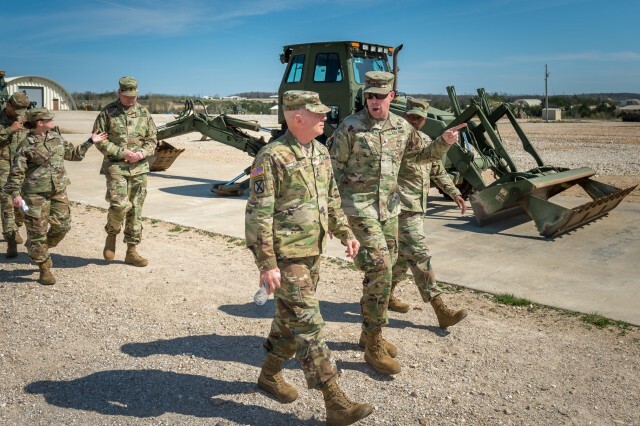 Maj. Melissa Judkins, spent his time at Fort Leonard Wood meeting with Maneuver Support Center of Excellence and garrison leaders and touring the sprawling post. 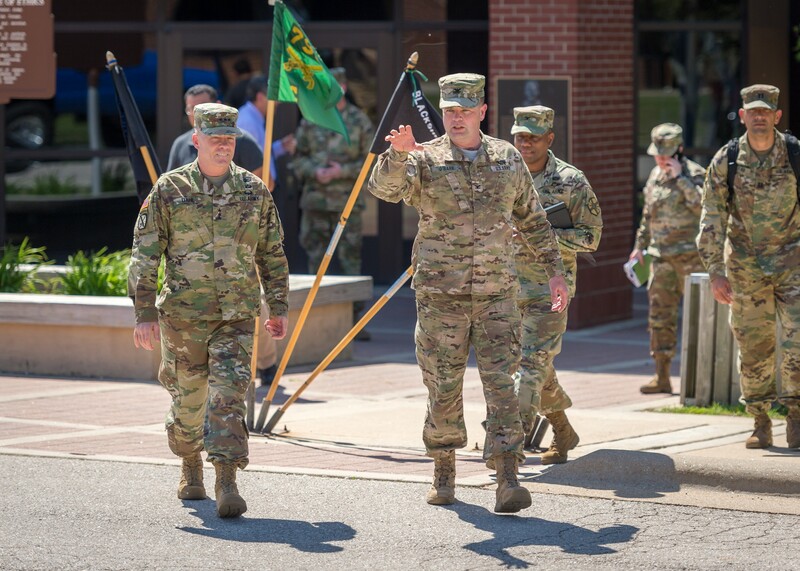 "Fort Leonard Wood is truly a Center of Excellence, which has state-of-the-art training to enable readiness across the joint force," Dahl said. He added that the professional IMCOM workforce and their counterparts at the tenant commands on the fort "make it all work." "These are people with a firm understanding and ability to deliver the training and skills Soldiers need to be ready to win in a complex world," he said. "I am inspired by the dedication and pride our Soldiers, Families and civilians demonstrate on a daily basis here at Fort Leonard Wood." During his visit, Dahl also held a working lunch with garrison directors and members of the Junior Executive Development Initiative team, where he spoke about the importance of IMCOM's recent transformation and his priorities. "My No. 1 priority is infrastructure, that is to address the urgent infrastructure challenges brought on by a decade of underinvestment to provide facilities that enable speed of assembly and deployment," Dahl said. "Simply put, we can't be a ready Army if our training and deploying infrastructure is inadequate." His other priorities include emergency services, support to training, Soldier programs and Family programs. He said supporting these priorities with the resources available is a "delicate act." 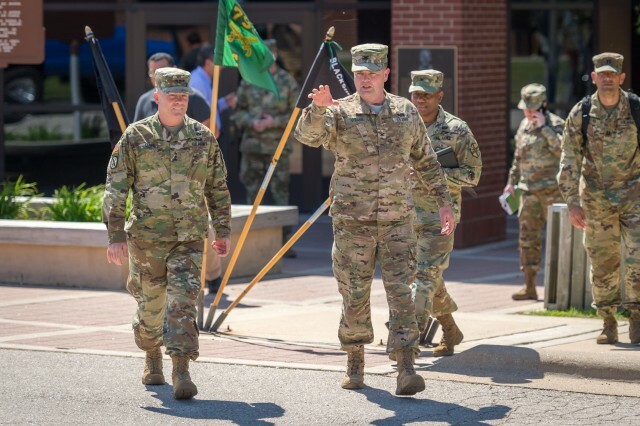 "I am confident Fort Leonard Wood leaders have a firm understanding of these priorities and work together to make tough decisions to balance available resources to provide installation services at a level we can afford," he said. JEDI team member Gabe Medina, who is the Information and Referral program manager for Army Community Service, attended the working lunch. Medina said he was impressed with Dahl's knowledge of Fort Leonard Wood and the programs offered here. "ACS is all about Family programs, and I'm excited to know that taking care of Families is part of his top five priorities," Medina said. Dahl explained to the team that IMCOM is a supporting command that integrates and delivers base support to enable readiness for a globally-responsive Army. He said knowing the Service Culture Initiative at all levels is important to the success of IMCOM's mission. "IMCOM is a customer-focused organization," he said. "Understanding and employing our Service Culture Initiative in all aspects of daily business will help with the efficient delivery of base support. I encourage leaders to support Operation Excellence training at all levels within our garrisons." According to IMCOM Public Affairs, the Service Culture Initiative is used to mitigate the effects of reduced resources on both IMCOM professionals and their customers. The initiative is built upon the fundamental premise that excellence in customer service is a byproduct of how the command treats IMCOM professionals. If they are happy, enthusiastic and well cared for, they will pass on and convey this positive attitude toward their customers.